An essential policy for those taking extended trips such as a gap year or round the world trip. ‘Backpacker’ provides cover for cancellation/ curtailment, personal possessions, emergency medical expenses, personal liability and accidental death & disability benefit. ‘Longstay’ provides higher limits and additional cover for gadgets, departure delay, missed departure, possessions delayed in transit, personal money & travel documents and legal advice & expenses. ‘Longstay Plus’ provides the same benefits as Longstay with enhanced cover limits. Automatic ‘Stop-Over’ cover – cover is automatically provided for ‘stop-overs’ of up to 7 days maximum in a higher rated area e.g. travelling to New Zealand via the USA. Gadget Cover (Longstay & Longstay Plus policies only) – cover is provided for theft; accidental damage; loss; breakdown and unauthorised call/data use for your gadgets including: handheld consumer electronic devices such as mobile phones, tablets, I-pads, Kindles, satnavs, cameras, lenses, camcorders, smart watches, smart glasses, head mounted displays, hand held games consoles, portable DVD players, headphones, wireless speakers, MP3 players and I-pods – but not laptop computers, purchased as new or, in the case of refurbished items, not purchased directly from the manufacturer or network provider in the UK; that is no more than 48 months old at the start date of your trip. Free sports & activities cover – a wide range of activities are included free of charge under Backpacker, Longstay and Longstay Plus with Activity Pack 1. Other activities may be covered under Activity Packs 2, 3 or 4 on payment of an additional premium. Please refer to the Activities Guide for further details. Excess waiver option – for a single additional premium the standard claims excess can be deleted. Note: the excess would still apply for Gadget cover and where any additional excess has been imposed following a call to Travel Administration Facilities to declare a medical condition. 24 hour medical emergency assistance – a 24 hours a day, 7 days a week, 365 days a year helpline is provided for assistance in the event of a medical emergency abroad. Available to residents of the UK, the Channel Islands or for British Forces Posted Overseas (BFPO) who have not spent more than 6 months abroad in the last 12 months. 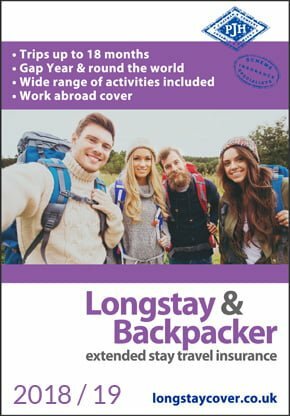 Longstay & Longstay Plus – From age 16* or up to age 75 if travelling to European, Australian and New Zealand destinations. Up to age 69 if travelling to Worldwide destinations. Note: ages are on the date you purchase your policy. This policy may not provide cover for re-occurring or existing medical conditions; however some cover may be available by contacting Travel Administration Facilities. See page 2 of the Insurance Policy for further details. Gadget cover – arranged by Bastion Insurance Services Ltd and underwritten by UK General Insurance Limited on behalf of Great Lakes Insurance SE. All other sections of cover are insured by Union Reiseversicherung AG, UK and administered by Travel Insurance Facilities plc. Or call 02392 419 070 Mon to Fri 8am – 6pm. Last updated: 2nd April 2019.